Spring (Half-Term) 2014 - "I've Never Been So Popular!" "I've Never Been So Popular!" You don’t usually hear people saying they want to hear more from someone do you? There is so much ‘noise’ out there these days but often so little ‘signal’ that I have always only tried to only send out my updates a few times per year which now coincide with the beginning of each academic term. However, many people tell me that they look forward to receiving my updates; some even say that they wished I sent them more frequent updates! So I have therefore decided to now also send updates at the beginning of every half term. I hope that this helps people. If you have been reading my updates, you will know that we now have probably only just six months to go until the Children & Families Act (which is still the Children & Families Bill at this time) is brought into force at the beginning of September 2014. As far as I know, the Bill is due to receive Royal Assent (i.e. become law) at the end of March 2014 but it will not be brought into force until September (probably). Most discussion in recent months seems to be about the Draft SEN Code of Practice that was consulted upon last year. I have previously analysed both the Bill and Draft Code of Practice in my updates. If you want you can still read my previous Spring (January 2014) update in full but you may find it easier to just read my summary of the Draft SEN Code of Practice. 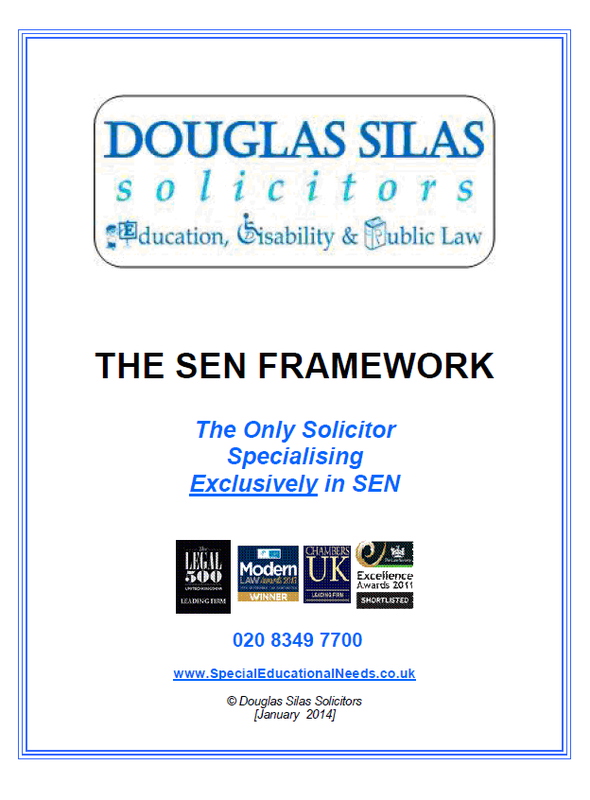 Even better, you can subscribe below to also get my free 10-page guide entitled ‘The SEN Framework’ as by doing so you will then also automatically be sent my SEN updates by email. The Draft Code was almost universally ‘rubbished’ by nearly all the main education/disability organisations when it was consulted upon at the end of last year, with one (IPSEA) even using the Education Select Committee’s wording back in 2006 (in relation to the current SEN framework now due to be replaced) saying that it was ‘not fit for purpose’. 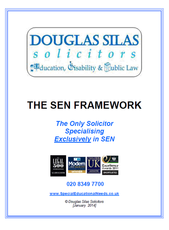 If you just want to know where things stand now, you might find it helpful to read this article entitled ‘The Present (Currently In The World of SEN) - February 2014’ which I wrote as part of a wider article. Although the new SEN framework covers from birth-25 (as opposed to 2-19 currently), there is no presumption that an EHC Plan will continue until a young person reaches 25, but only if the ‘outcomes’ on their EHC Plan are still to be achieved. There is actually a sixth thing that worries me most at the moment. There is no legal definition of ‘mental capacity’ in the Bill, the Draft Code or even the Draft Regulations (which were also consulted upon late last year). We may therefore find ourselves in the controversial position that, when a young person with SEN does turn 16, their parent’s legal right to engage with or challenge the LA may automatically transfer to them. This could result in parents being barred from continuing to act as advocates for their child. I truly hope that this does not happen. Many people are cynical about what is happening. There are concerns that there are many omissions from the current SEN Code of Practice and that the Draft Code uses very confusing wording and lacks structure. I truly hope that my fears are unfounded. As I have said before, it is important that you receive and read my next few updates and also pass them on to others who may find them relevant. Before we have a new SEN framework, we also need to consider the children/young people who are due to start a new school/phase of education in September 2014. They may be due to transfer from primary to secondary school (i.e. Secondary Transfer), from secondary schooling to Post-16 education (i.e. Post-16 Transfer) or even other children who are due to start primary school or enter a new phase of schooling. Children with ‘Statements of SEN’ who are approaching Secondary Transfer should have received a final amended statement naming the school they should go to in September by 15 February in the academic year before transfer. If their parents dispute the placement they have a right to appeal to the SEND Tribunal within a two month window. Although the Special Educational Needs & Disability (SEND) Tribunal normally applies a 20-week timetable for these ‘Phase Transfer’ cases (which include from Primary to Middle school or Middle to Secondary school) the SEND Tribunal now automatically instead allocates a 12-week timetable to ensure as best they can that appeals are heard by the end of the academic year in July so that everyone knows where the child is supposed to go in September. Unfortunately, the ‘Phase Transfer’ regulations do not automatically apply to transfers from secondary school to Post-16 provision (i.e. there is no legal requirement to issue an amended Statement by 15 February) but the SEND Tribunal has fortunately decided in the past couple of years to accord these cases the same 12-week timetable. if it is brought to their attention at the outset. Unfortunately, children joining infant/primary schools though have no deadline for the amending of their statements or to automatically expedited hearings. If you find yourself in of the above scenarios and need help, please contact us as soon as possible on 020-8349-7700 or Request A Call Back. If your child is going through Secondary Transfer this year you can also read our FAQs about Secondary Transfers. This is especially important if you were expecting a Final (Amended) Statement but have not received it yet. Please also note that, even if the above scenarios do not apply to you yet, but may do in the future, whilst we will always do our best for any parent who approaches us at whatever stage, they always stand a better chance of sorting things out successfully (sometimes without needing to appeal) by approaching us as early as possible. For example, sometimes we can help even before a Year 5/Year 10 Annual Review (rather than leaving it until when parents have a right to appeal). Probably the best reason for me doing a half-termly update is because I can draw attention to recent/forthcoming SEN events since my Spring update (in January 2014) and which are coming up before or soon after my Summer update (which will not be unitl late April/early May 2014). Since my last Update, aside from a few meetings that I have been to, there does not seem to have been a lot for me to talk about. However, the next couple of months are full of SEN events that you may find of interest depending on your professional/personal focus. 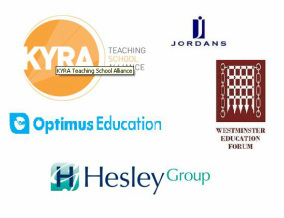 Westminster Education Forum on ‘Special Educational Needs & Disabilities – Implementing the Children and Families Bill’ on 8 May 2014 in London (aimed at all type of professionals/ parents/ politicians). I am due to be speaking at a few of these events so, if you do attend, please try to say ‘hello’ to me personally. Although I only started using Social Media at the beginning of this year, I have already been very taken by how many people have ‘followed’ me on Twitter, ‘liked’ me on Facebook or ‘connected’ to me on Linked-in. I was amused to find that when I started using these platforms it felt like there had been a party going on for a while that I had not known about! Thank you for the ‘tweets’, ‘retweets’, ‘mentions’ and messages people have sent me these past couple of months. I was also touched when one person I met recently told me that I “tweet intelligently” by only providing useful information on SEN for people to read. Even if you already receive my updates by email directly, if you also use Social Media platforms like Twitter, Facebook, LinkedIn* or Google+, please ‘follow’ or ‘connect’ to me by using the relevant Social Media buttons below or on every page. You can also see my ‘Tweets’ here to find out if what I say is relevant to you. 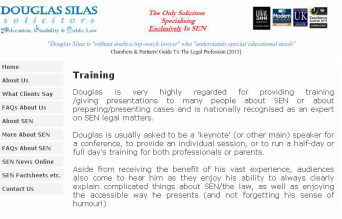 Finally, since the beginning of this year, I have been approached many times to speak for or provide training to education/SEN professionals/organisations (both those helping parents and those from schools/Local Authorities [LAs]). They all want me to help them prepare for the incoming new SEN framework from September 2014. Some have even been as forward thinking to ask me to train them twice, not only now but to also provide a ‘refresher’ for them in Autumn. I've never been so popular! If this is something you feel your organisation could benefit from, then please contact me as soon as possible as my diary does fill up quite quickly. Whilst there are, of course, similarities in the material I present, I endeavour to tailor each training session to the audience’s requirements, which requires preparation time and, of course, I have the usual casework pressures. For now, the countdown has started. As the Kyra conference has put it so well: ‘Change Is Coming’! P.S. I always find it helpful to find out what people think about these updates, so please take a few seconds to tell me what you think by going to ‘Spring (Half-term) 2014 update – your thoughts’ – there are just 3 quick questions.